Salvation And Survival: Really!? "Prayer-Shaming" Is Where We Want To Go After This Tragedy? Really!? "Prayer-Shaming" Is Where We Want To Go After This Tragedy? I find it incredibly sad that one of the hallmarks of the terrorist tragedy in San Bernardino will be the coining of a new media term, known as prayer-shaming. It seemed that in less than 24 hours after the massacre, the anti-God crowd couldn't wait to spread their venom against those who turned to the only One who could offer solace in such a time of senseless evil. The attempts by the media and the empty souls who tweeted their disrespect for the faithful was truly disgusting. Yes, they will try to say it is a reaction to what they saw as "posturing" by politicians and presidential candidates; an attempt to garner votes by taking advantage of a tragic situation in order to promote themselves. And, yet, it is most likely true that if those same politicians had come out screaming for more gun control as their response to San Bernardino (and thus endearing themselves to the anti-gun audience), then they would have been hailed as compassionate and caring. But anytime FAITH comes to the forefront, then it must be dismissed as hollow or foolish behavior; and those of us who cling to it should be made to feel ashamed for its inadequacy. In other words, they look to man to solve the evil intentions of the wicked, and the fact that we Christians turn to the Sovereign God of the Universe for comfort and strength is nothing more than empty expressions. But don't take my word for it. 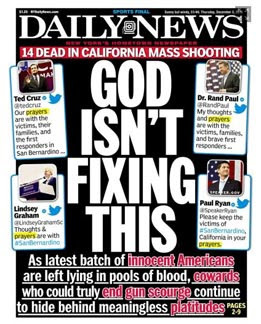 Let the cover of the New York Daily News tell you itself: GOD ISN'T FIXING THIS! it screams, followed by the subtitle, which says, "As latest batch of innocent Americans are left lying in pools of blood, cowards who could truly end gun scourge continue to hide behind meaningless platitudes." The backlash came after Ben Carson, Ted Cruz, Rand Paul, Paul Ryan and others tweeted that their "thoughts and prayers" were with the victims of the terrorist attack. Immediately, they were castigated for accepting campaign donations from the National Rifle Association, while tweeting their intentions to pray in the aftermath of the tragedy. (Funny, but I don't see any hypocrisy in that at all. The former is a decision made as a citizen of this world; the latter, is a spiritual response as a member of the Family of God). And ironically, it doesn't seem to bother them that the White House tweeted its thoughts and prayers to the victims of the Paris attacks. So, I have to ask... is it really the idea of prayer that offends them, or just that prayer was the first response of people, rather than demanding stricter gun control? I also noticed that the White House did not tweet any such offering of "thoughts and prayers" to the victims of San Bernardino, but rather tweeted an interview with CBS News, in which the President said "our hearts" go out to the victims and families....". That's a pretty big difference, to me. Offering my heart does not extend the same power [to the victims] as appealing to God to heal broken hearts and the consequences of evil men. 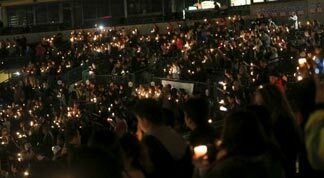 For me, the real tragedy is what was described by Charisma News: "Led by a rabid media, the headlines were no longer about the victims and their grieving families—but about leaders who dared to do what the frightened people inside the killing ground asked: pray." Who can forget the text that one of the victims sent to her father during the slaughter: "Shooting at my work ... People shot. In the office waiting for cops. Pray for us." Those in the midst of those terrifying moments knew what would help them the most ... prayer. They knew that the Lord God Almighty hears the prayers of His children, and they knew nothing was impossible with Him. They knew they could expect almighty and supernatural results from prayers sent heavenward. You've heard it over and over.... Guns don't kill people. People kill people. And it is a spiritual sickness that pervades the minds and hearts of men that drives them to such murderous acts. But those without a spiritual connection to God will never understand that, and so, they continue to blame "tools of violence", rather than the "spirit of violence" that pervade men's souls. Once again, Charisma News did an outstanding job of compiling clear, logical and convincing thoughts on this subject: "...hate is what drives men to slaughter innocent people—not guns. And the government can't make us safer until it recognizes that the problem isn't the instruments of violence, but the environment of it." They further quote The Federalist's Mollie Hemmingway, who wrote: "[They] are only diminishing the Christian faith so that they can exercise their own religion: big government. [Progressives] explain that the god of good government would have been able to take care of us if only we'd given it sufficient power to do so. In this case, that power is gun control... Government — if made to have sufficient size, scope, and proper management over the affairs of man—will fix, or at least seriously mitigate, the problem of evil in the world. They tend to believe that man can be perfected, and perfected through government action. These almost cartoonish denunciations of prayer we saw yesterday, combined with the implicit praises of government action, are best understood as a sort of primitive religious reaction to the problem that growth of the state still hasn't fixed the problem of evil in the world." And we, the Faithful, know it never will. That is why it is more important than ever that we continue to pray! That's why thousands gathered at a stadium in San Bernardino, and in churches around the nation --- to pray for those who were senselessly killed and for those who grieve; to declare to the wicked rulers and principalities in the spiritual realm that the city of San Bernardino does not belong to them; to proclaim that we are active in the spiritual war against our nation; and to state our profound belief that God will give Justice to His elect, who cry to Him day and night. Finally, we claim victory in the Name of Jesus! And no amount of "shaming" will keep us from praying at all times in the Spirit, and with all prayer and supplication!